You might’ve heard about Under Armour’s crazy new zipper that only requires one hand to zip. Though the futuristic magnetic clasp jigsaws nicely with the company’s high-performance standards, the zipper originally came from more humble origins: helping a sick man lead an easier life. The Quickzip story starts in upstate New York, hundreds of miles from Under Armour’s massive research and development center in Baltimore, Maryland. Engineer Scott Peters’ Uncle Dave was living with myotonic dystrophy, a degenerative disease. Among the condition’s many, variable consequences is a loss of muscular dexterity in the extremities, and for Peters’ uncle, that meant zipping up a coat in the long, miserable winter near Buffalo, New York was a terrible burden. So Peters and his mother Nancy, a career occupational therapist, decided they were going to make a zipper to help Dave out. In a crude early prototype, they attached magnets on the two sides of a stock YKK fastener, and when they stuck together with a satisfying clink, they knew they were on to something. The jacket zipper has been a staple of industrial clothing for at least a hundred years. The original “clasp locker” originally debuted at the 1893 Chicago World’s Fair. There are a few varieties of zippers, but the basic principle remains the same across each: Pull a hand-operated slider in one direction and it locks together two rows of teeth, forming a closure. Pull the slider the other way, and it unlocks the teeth. 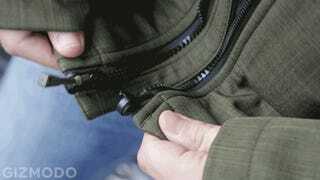 In the case of a jacket or a hoodie, the slider employs a “box and pin” design. Stick the pin into the box to lock the teeth into alignment, then pull the slider. It’s ubiquitous because it’s simple, it’s cheap to manufacture, and importantly, it’s crazy practical. That is, until jamming the pin into the box is impossible because your beautifully evolved ape digits suddenly don’t dance with the quickness they used to. After the Peters’ early prototype was done, it was pretty clear that magnets could provide the force needed to make a closure, but there was no simple way to leverage magnetic force to jam a pin into a box. So after lots of experimentation, the team eventually settled on a “hook and catch” design to replace the traditional closure. Instead of threading a pin into a box, the magnets pull a hook-like pin over the top of a catch, which settles itself into place, locking the first set of teeth together. The user then grabs hold of the slider and pulls the zipper closed with ease. In a video test of a Quickzip prototype, Uncle Dave illustrates his difficulty using a standard zipper, and the ease of using the new product. Last year, DNS Designs received a patent for a “self-aligning zipper,” which they understandably planned to market as a medical device—a niche product for people like Uncle Dave. After discovering the prototype at a trade show, however, Under Armour saw the Quickzip’s potential as a performance product. Sure, the zipper could be fastened and operated by people who had limited dexterity, but it could also serve athletes who needed to be able to zip and unzip quickly without thinking or expending too much energy. Consider the cyclist in training peeling of layers, or the football player fumbling with a giant coat during a freezing December playoff game. Under Armour licensed the Quickzip and was kind enough to provide Gizmodo with a sample jacket. (It’ll be available to the world on Under Armour outerwear in Fall 2014.) It works remarkably well, and it definitely feels like the future, thought it does take a little getting used to. This surprised Peters. “A lot of times that engrained motor skills you’ve been trained with your whole life sort of hinder your ability to use it,” he says. There’s a learning curve to the the thing. You don’t remember learning how to use a zipper, but now you’ve got to learn all over again. If you grab the two sides of the closure and try to use it like an old-fashioned box and pin, it doesn’t work quite the way you expect it to. Sometimes, the hook doesn’t quite make it over the catch and the closure’s teeth don’t lock into place, leading to an awkward swing-and-a-miss moment in which you’re just zipping air. The best method for using the zipper is actually counter-intuitive. You’re used to jamming both sizes of a box and pin together, but with the Quickzip, what you really need to do is just let the magnets pull the closure together securely, then pull the slider up. It’s a motion with a nimbler, slower cadence than the harried tug-and-go yank of the old box and pin. People will probably call this the one-handed zipper forever because that original GIF of a svelte athlete effortlessly zipping, which made epic rounds of the Internet. The designers definitely tested this method for sealing the closure. It can be done, and if you only had one arm, or a broken arm maybe, the Quickzip would certainly be easier to use than the old design. But several Gizmodo staff tried the sample coat on, and none of us could zip it up one-handed without great difficulty. 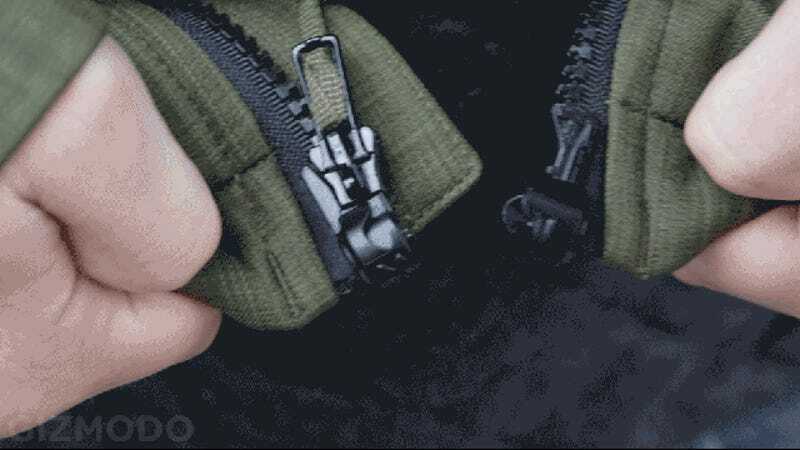 To really appreciate the Quickzip’s power, stand some where cold, put on your bulky gloves and watch the hook and catch connect. The magnets do all the work when you’re at your least dextrous. It turns out that just like Uncle Dave, we’re all a little clumsy sometimes.